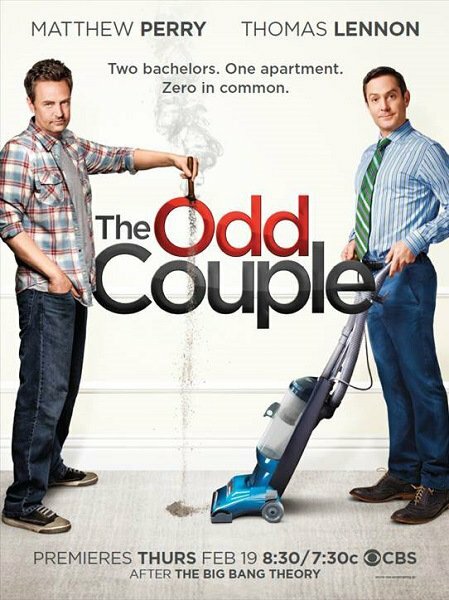 What does 'The odd Couple' mean? each one of him is divorced or has been dumped by his wife. Two people who live together or are intertwined romantically that are grossly different from each other and would not normally get along under other circumstances. For instance, one person in the couple could be an introvert and the other an extrovert, although there are normally several distinct differences between the two partners to have the term "odd couple" used to describe a specific relationship. An odd couple can also refer to two heterosexual bachelors living together, who are enjoying their singledom to the fullest. The word "couple" literally means two of something. We routinely refer to two people in a romantic relationship as a "couple". The word "odd" means unusual or strange. The original 1968 movie was about two men who were sharing an apartment and who were wildly incompatible: one was fastidiously neat and the other very messy, one was culturally refined and the other very casual, etc. So they didn't fit together well as a couple. They were a strange pair, an "odd" "couple". Apparently there's a 2015 TV series with the same title. I haven't seen it (I don't get broadcast TV any more), but from a description it appears to be a remake of the old movie. Not the answer you're looking for? Browse other questions tagged meaning names or ask your own question. What does the phrase “inspired vegetables” mean? What does the phrase 'waking thoughts' mean? What does the phrase “I will race you” mean?